The “Hot Hand”: Myth or Reality? Whenever you attend a basketball game, sometimes there is a player that makes one shot, then another, then another, and before you know it they have 15 points in one quarter. Some players say that in this streaky state, it’s almost as if the 18 inch-wide rim expands to the diameter of a bathtub. Kobe Bryant says, “You get in the zone and try to stay there. You don’t think about your surroundings or what’s going on with the crowd or the team. You're locked in.” Fans that witness this special type of performance shout phrases like, “He’s on fire!” or “He’s got the hot hand!” This phenomenon of the “hot hand” is defined as the “putative tendency for success (and failure) in basketball to be self-promoting or self-sustaining.” This article explores and analyzes evidence to see if the “hot hand” is truly psychological momentum or if it is just a cognitive illusion. 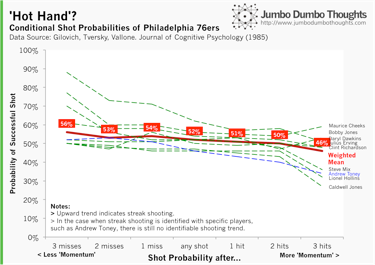 These same psychologists conducted a study during the 76ers 1980-1981 season. Philadelphia’s team statistician recorded field goal records of individual players for 48 home games. Based on the graph, we can see that Julius Irving has a pretty consistent probability of making his next shot regardless of if he is missing or making his shots (52-53%). On the other hand, Bobby Jones actually has a higher probability of making his next shot after 3 misses (61%) than after 3 makes (53%). Therefore, it is evident that there is no consistent pattern between makes, misses, and the next shot. Published authors in the Journal of Sport & Exercise Psychology, Jonathan Koehler and Caryn Conley, conducted another study of the hot hand by focusing on the annual shootout contest held during NBA All-Star Weekend. The study took videotapes from four contests in the 1994-1997 contest and studied the scoring patterns of the shooters during all four rounds. The study first performed a “runs analysis” on the data from each of these 23 shooters. 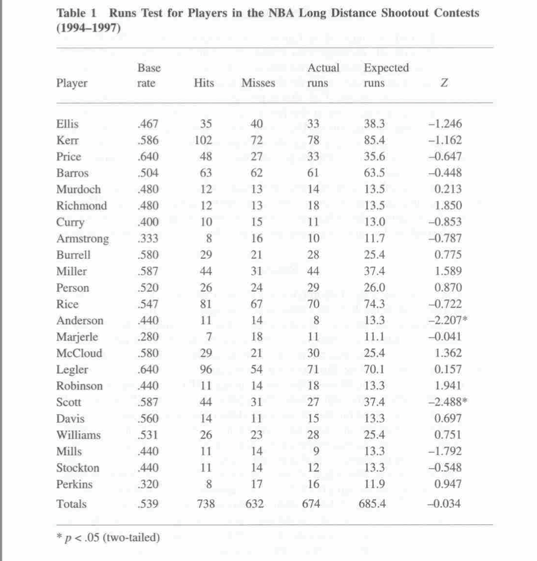 A “run” was defined as “a set of one or more hits and misses.” Half of the shooters had fewer sets of made or missed shots than was expected of them (52%) and the other 48% had much more sets of made or missed shots. If the hot-hand hypothesis were true, the shooters would have fewer runs, but the data proves that this is only true half of the time. After collecting the “runs” data, they compared these numbers to each player’s base-rate shooting success. The results found that these shooters made 57.3% of their shots following streaks of three or more hits, and 57.5% of shots following streaks of three or more misses. This data further supports the fact that a player does not necessarily need to have the hot hand in order to increase their likelihood of making their next shot. From these two data collections, we can see evidence of the hot hand just being a cognitive illusion. 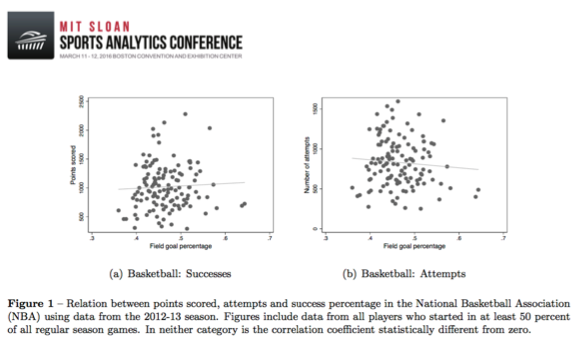 In the two graphs to the right, it is obvious that there is no distinct correlation between field goal percentage and points scored/number of attempts. So, how can this be? Why is this idea not true? Brett Green, who presented his analysis of the hot hand as it pertains to the MLB, raises an interesting explanation as to why this could be in basketball. He says that a player who is considered to be “hot” is exceeding his/her teammates shooting percentage assuming they took their normal types of shots and defensive attention. As a result of being “hot”, the player will attempt more difficult shots and eventually lower their marginal shooting percentage. Therefore, “hot” shooters are “unlikely to exhibit a higher shooting percentage than they typically realize. This blog post was written by Samford University student Cassidy Williams.